After several weeks of some ache and discomfort in my wrist, I did a little research online and discovered that I seem to be suffering from an RSI - Repetitive Strain Injury. When you consider all the computer work and wrist wrenching that goes on in my studio, it's really quite amazing that it hasn't happened sooner. What I found online was a whole host of maladies that fall under this RSI heading, the most well-known being carpal tunnel syndrome. When my thumb began to occasionally feel numb about a week ago, I then went in search of some self-care sites. 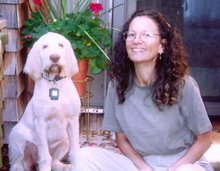 I found and have been using some stretching exercises, acupressure points and massage techniques - all of which have helped. Despite minor progress I made an appt. with an orthopaedic guy in town .. though as he's only IN town twice a week, I can't get in until June 13. So let us hope the things I've been doing continue to help and not hinder the situation. The necklace above was completed during my artisan guild's Open House celebration at the Shops at 25 West in Little Falls on Sunday, May 20. Not a lot of pain in knotting. I finished it up here in the shop with a couple 14k jump rings and a 14k gold handcrafted "swan" clasp. 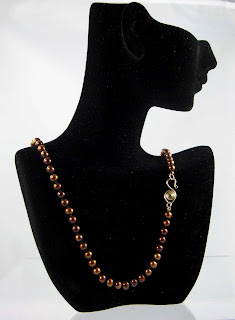 The pearls are 5.5mm to 6mm cultured fresh water pearls in a color called Marine Teak - a really rich coppery brown shade - knotted on chocolate silk cord. As usual, if you're reading this on my blog and not in an email, you can click on the pic for a closer look. Another thing I have to do is keep these posts short (my husband is no doubt laughing at the thought of my trying to do that ) .. I think it was computer activity and not jewelry work that did it. So I'm off to dig into some bead drawers and see what wonders are waiting to be rediscovered!